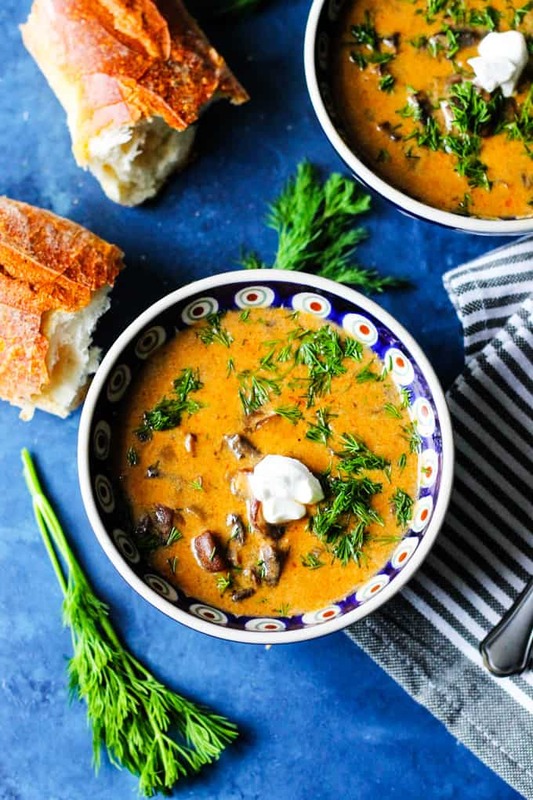 What makes this Hungarian Mushroom Soup so unique? 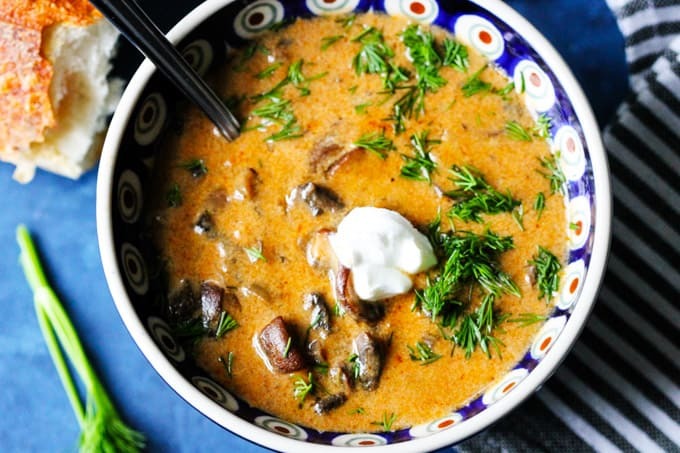 Chunks of mushrooms, with authentic Hungarian paprika, it’s creamy texture and a lot of fresh dills. You can make it mild with just sweet Hungarian paprika or spice it up a notch with some hot Hungarian paprika. 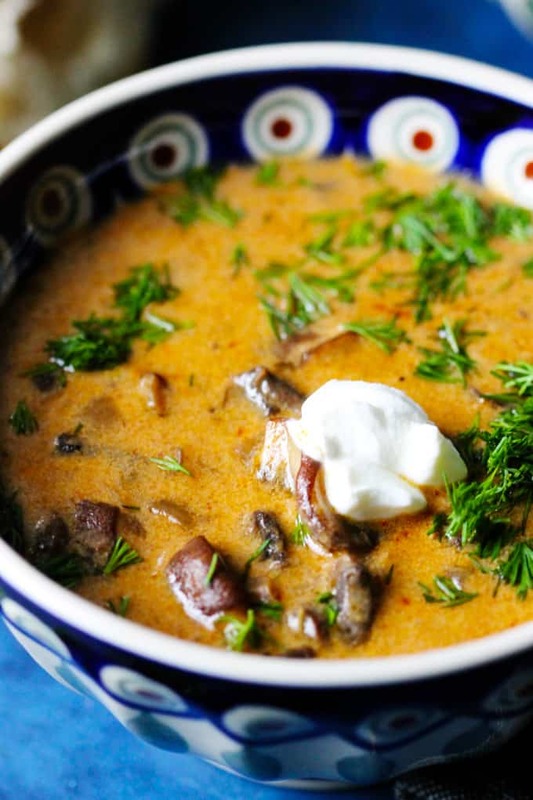 Whichever road you choose, I can guarantee that you’ll LOVE this Hungarian soup. If you follow this blog then you probably already know that I was born and raised in Poland. When I was a child I would also vacation a lot in both Hungary and Bulgaria, for my summers. During those trips, I came to learn that there are a lot of similarities between the cuisines in Eastern Europe. I think that most of these countries have their own variations of mushroom soup. Eatable mushrooms were plentiful in our forests, which essentially spelled an easy and inexpensive meal. I wrote about mushroom picking in this post for Creamy Mushroom Sauce with Wild and Fresh Mushrooms, if you’re interested in reading about this tradition. Anyhow, in Poland, we would make a similar soup to this Hungarian Soup. Basically, the Polish version wouldn’t have paprika and we would either add potatoes or serve it with big noodles. Other than that it was a very similar soup, chunky, creamy and with dill. Truth be told though (& don’t tell my Mom), but I actually prefer the addition of the paprika. Soy Sauce – I know, this comes as a surprise, but we usually use a seasoning that is called ‘Maggie’ and it is difficult to find in the U.S. It has a similar flavor profile to soy sauce so don’t stress about it. Just use your favorite soy sauce. Step 1: Chop your onions. 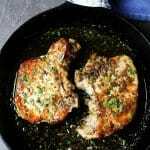 Heat up butter in a dutch oven or other heavy pot, add onions and sweat for 5 minutes. Step 2: Wash and then slice your mushrooms. Add mushrooms to the onions, season with some salt and pepper and cook for about 10-15 minutes, until they’re soft. Step 3: Add sweet paprika and flour to the mushrooms, cover well and cook for about 2-3 minutes. 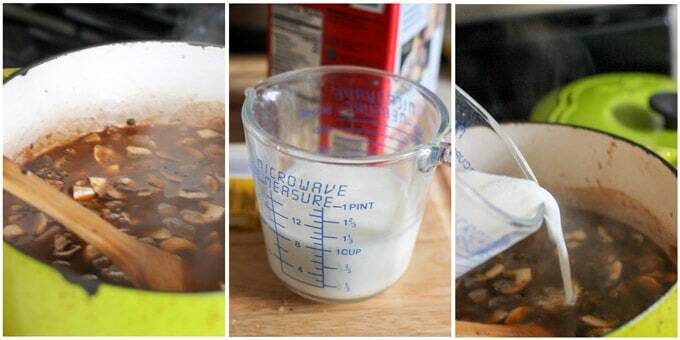 Step 4: Add milk, broth and soy sauce. Cover and cook for about 15 minutes. 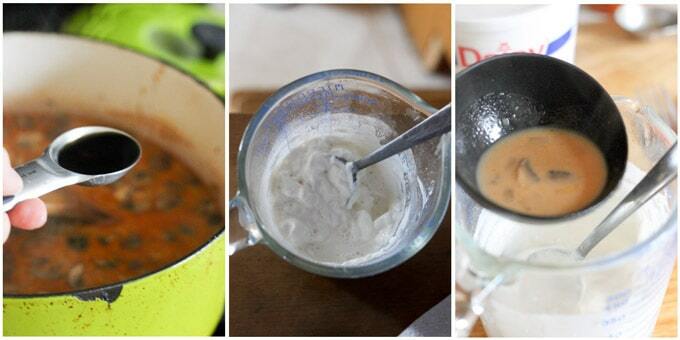 Step 5: If your soup is not thick enough you may create a roux by combining flour with sour cream and touch of water. If your soup is the right consistency, you’ll just add a dollop of sour cream to a measuring cup. In order to add sour cream to the soup and make it super creamy, you need to temper it. In order to do this, you will need to add a little bit of hot soup to your measuring cup with sour cream OR sour cream/flour roux and then mix it well. Keep adding the hot liquid and stir well until you have a full cup. Then you’re ready to add it to your pot. Your soup will be creamy and smooth. Step 6: Add lemon juice. Then adjust seasoning with salt and pepper, as needed, and add fresh dill. Serve with crusty bread! 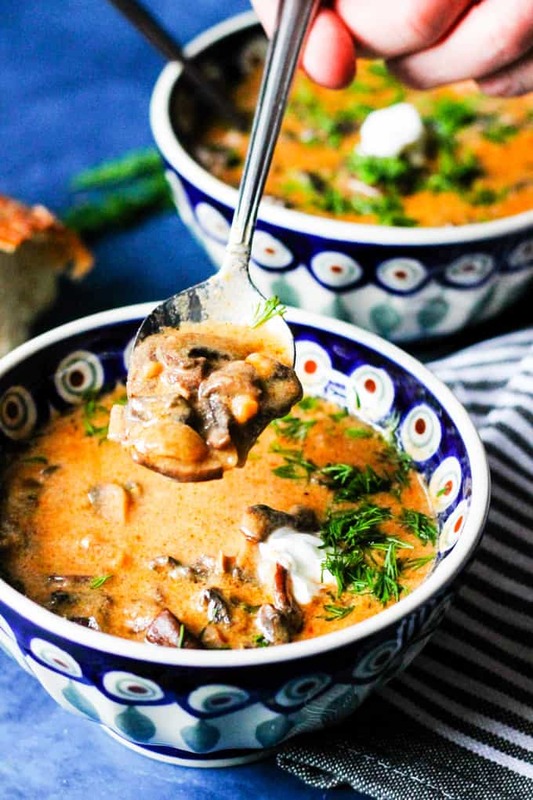 What makes this Hungarian Mushroom Soup so unique? 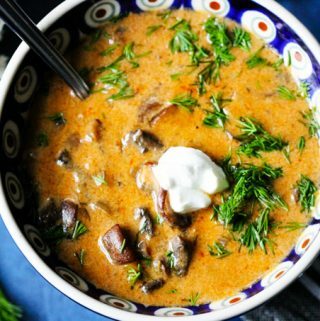 Chunks of mushrooms, with authentic Hungarian paprika, it's creamy texture and a lot of fresh dills. 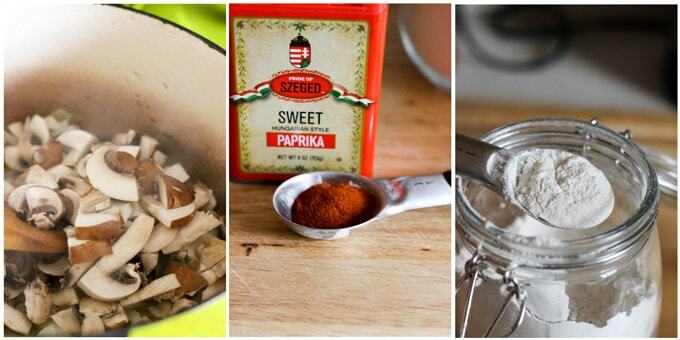 You can make it mild with just sweet Hungarian paprika or spice it up a notch with some hot Hungarian paprika. 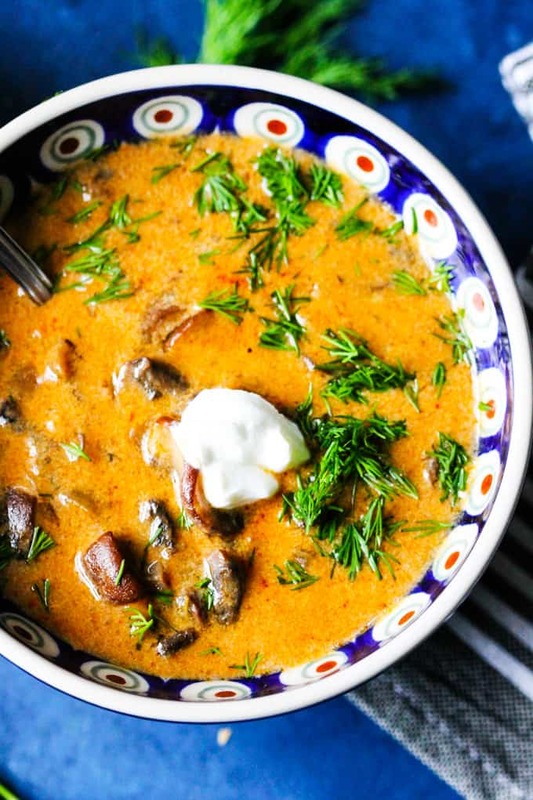 Whichever road you choose, I can guarantee that you'll LOVE this Hungarian soup. Chop your onions. 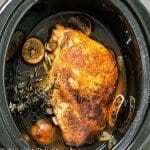 Heat up butter in a dutch oven or other heavy pot, add onions and sweat for 5 minutes. Wash and then slice your mushrooms. 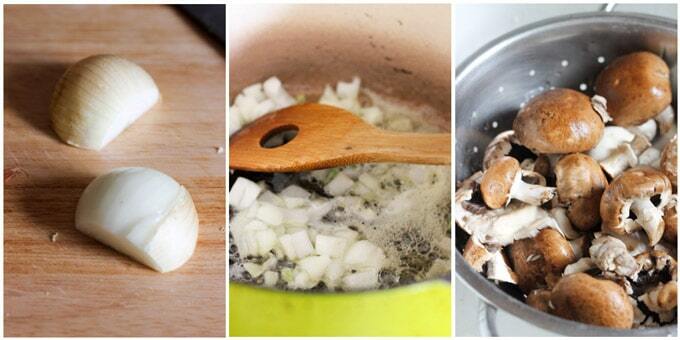 Add mushrooms to the onions, season with some salt and pepper and cook for about 10-15 minutes, until they're soft. Add sweet paprika and flour to the mushrooms, cover well and cook for about 2-3 minutes. Add milk, broth and soy sauce. Cover and cook for about 15 minutes. 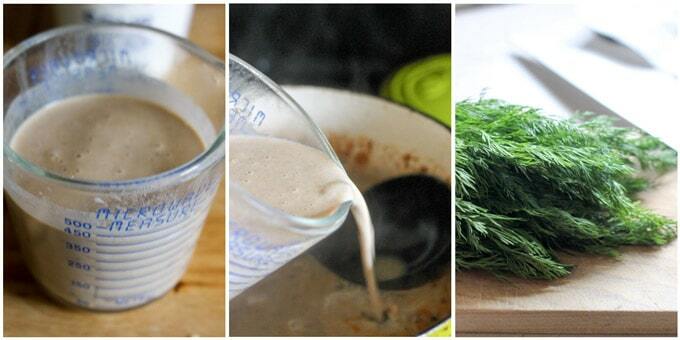 If your soup is not thick enough you may create a roux by combining flour with sour cream and touch of water. If your soup is the right consistency, you'll just add a dollop of sour cream to a measuring cup. In order to add sour cream to the soup and make it super creamy, you need to temper it. In order to do this, you will need to add a little bit of hot soup to your measuring cup with sour cream OR sour cream/flour roux and then mix it well. Keep adding the hot liquid and stir well until you have a full cup. Then you're ready to add it to your pot. Your soup will be creamy and smooth. Add lemon juice. Then adjust seasoning with salt and pepper, as needed, and add fresh dill. Serve with crusty bread! If you want to make this soup a little spicier, add a pinch of Hot Hungarian Paprika when serving in the bowls. My local grocery stores actually carry Maggie! Would I just substitute it directly for the soy sauce or will I need to adjust the amount? Dill, paprika and mushrooms? This sounds like heaven in a bowl! This was so delicious! I’m Hungarian so always up for trying recipes from there. So good and so easy to make! Thanks for sharing! 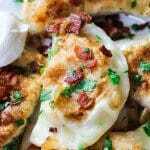 Love this warm and comforting recipe! Such great flavor and so easy too! Amazing! This soup looks so good. Never would have imagined a vegetarian recipe from that part of the world. Thanks for sharing. I’m all in creamy soups lately. This mushroom soup looks absolutely gorgeous. Super delicious and so tasty. Love the addition of fresh dill. I must give this a try. ASAP. How many mushroom cubes will make 3 cups mushroom broth, I’m thinking of buying the cubes on Amazon. It all depends on the size of the cubes. Start with one and see how it taste and after that add 1/2 at the time to make sure that it is not too salty.